I was under the impression that airports were more or less 24-hour deals. 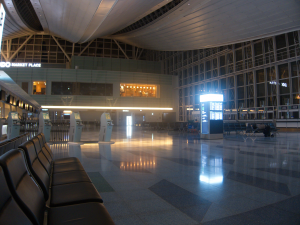 At least in Haneda, there’s definitely a dead time that seems to be between midnight and 4am or so. In my case, my flight out of Japan leaves at 6:50am. The first train in Tokyo runs around 5:00am and takes about an hour to get to Haneda. That leaves me with not nearly enough time to take care of business. Also, apparently a taxi from my hostel to Haneda would be over 10000yen, so that’s not really an option either. The only real option then is to take the last train the night before and get to the airport around midnight. I can’t imagine that this is all that uncommon a scenario, and I seem to be right. In the International terminal at Haneda, which is pretty large, there are a bunch of seats and a bunch of people who seem to have similar situations as mine. Unfortunately, I can’t even check in and get rid of my luggage until the American Airlines counter opens at 4:20am. Luckily, there’s a vending machine nearby that accepts IC cards, so I can buy drinks with the extra money on my Pasmo card.